measure the other side that didnt bend. Get a hold of Mikel5469 on here he rides up in that area a ton. As far as locally we will be hitting the track as soon as the weather cools. I know as soon as things calm down around the homestead I will be taking a trip with mike real soon. We just put on 100 miles a couple weeks ago up in rosecity and bull gap. The trip was great. We put on just over 100 miles and the weather could not of been better. Mike has the go pro so he will have to put up the vids. Its was a blast you should of come up LOL. Ballistik replied to ppalomino's topic in New Members Area! Holeshot also there are enough people on this thread alone that you could hook up with and ride. 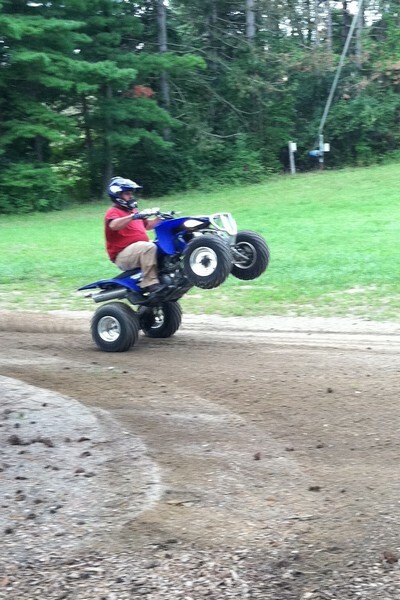 Mikel5469, Me and Ppalimino all ride sport quads. Holeshot if i where you I would not base a quad purchase off of one place. Personally the mounds is nothing but mud and a utility quad is perfect for there. With that said that is the only place that a utility quad would be better than a sport. Most private land owners that allow quads to ride from my experience wont let the utility quads do any mudding as it creats a lot of damage to the area and they dont want to deal with the ruts and whole from the puddles. As far as the state land I have been up to this year you can ride anything but I personally could not see riding these trails on a utility as they are just way to fun on a sport as you can go much faster and there are a TON and I mean a TON (ha Mike5469?) of whoops that would beat you up on a utilty. Its all on what kind of riding you personally like to do. There are areas around that you can find that would be perfect for either type especially if you look on forums and talk to enough people. You will get in contact with people that know of places for either or. The web is a wonderful place. Good luck and keep us posted. well if you drive up to me I can take you up to Mike and we split gas from there. Come on you know you want to go. YOu can do it. Gas is cheap this week. ONly 3.54 here. Only two more days. Come on we are only going up for a day ride you dont have to kill your whole weekend. YOU KNOW YOU WANT TO GO!!!!!!!!! Mikel5469 and I are trying to get some people to gather for a ride up in Rose City/Bull Gap area. If your interested contact either one of us. Hope you can make it!!!!!! I have an 05 with a full gytr exhaust, stock cleaner and lid on the box. I went from a 158 main,42 pilot and 1 1/2 turns out on the mixture screw to a 168 main, 45 pilot, and 2 turns out on the mixture screw when I put the exhaust on. It runs perfectly . I hope this gives you some sort of a starting point. the 158, 42 and 1 1/2 turns was the stock setting from yamaha. Ballistik replied to MIKEL5469's topic in General Talk - Anything Goes! May be old but still looks and runs like new. Great Job Mike. Memorial day coming up !! Ballistik replied to quadnut20's topic in General Talk - Anything Goes!